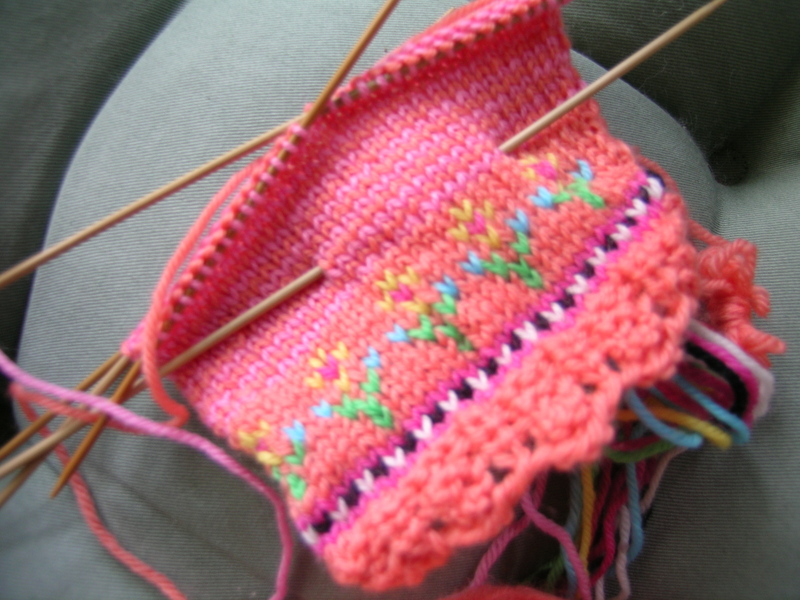 When I find a really cute pattern, I want to knit it over and over, until I feel saturated with the design. That in mind, I started making the Baby Zebra sweater that goes with the dress. I am using the beautiful Tangerine color instead of the red again, and all the other colors the same. 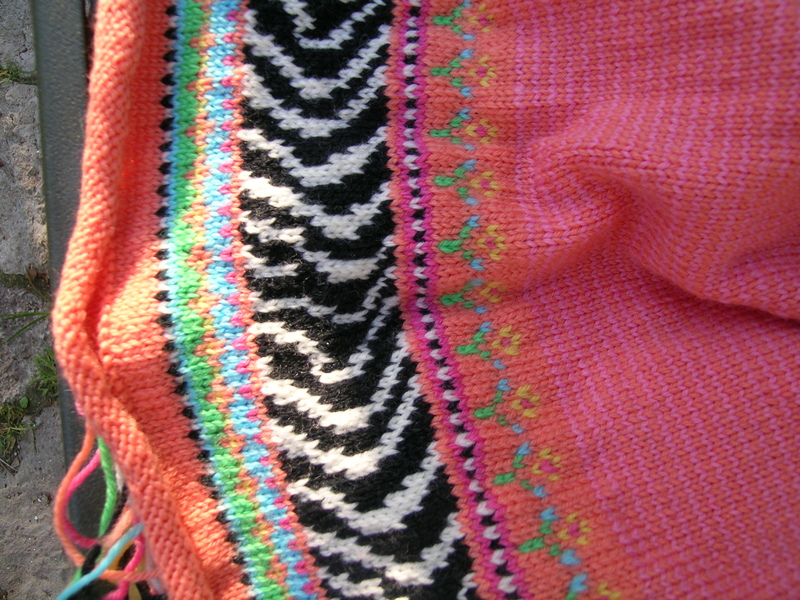 The patten calls for the sweater to be bright red and hot pink stripes above the fair isle banding. I thought that this was too stark, even with my Tangerine and hot pink, so I substituted the hot pink for a soft pink. I love the effect. In the right light you see the subtle stripes, but the overall effect is a softer orange color. I originally had continued the body with size 2 needles and it was bulging out so I ripped that back and used size 1 needles. Makes the striping effect even more dense and subtle. I have stopped at the top for the neck opening, I am struggling what to do there without adding a new strand of yarn each row. The directions are lacking here, as you go from knitting in the round and changing colors every row to knitting back and forth and still trying to change colors in every row while doing the neck decreases (that is the kicker). So, I opted to start on the sleeves while I mull over what to do at the top of the sweater. I had made the same mistake of not going down in the needle size. I ripped that back and reknit with size 1 needles also. 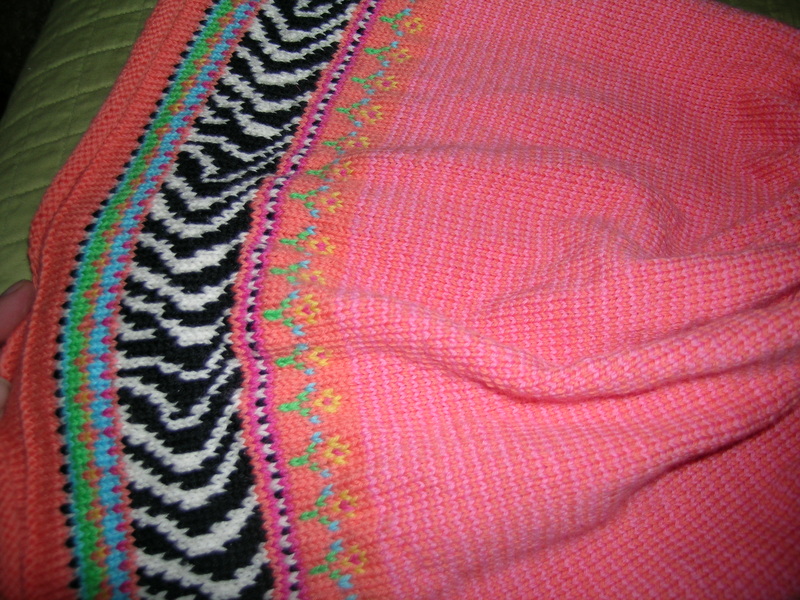 At the same time, I changed the increases from every 5th row to every 6th row since my knitting was more dense. This also gave me the added advantage of only increasing on a pink row, so keeping track of that is much simpler.